A fruity nose from the off, with dark berry jam, some green brambles, a dunnage effect, but more in line with the port cellars of Porto. The port finish has been quite active. There is a backing of vanilla ice cream (with the berry compote) and a touch of pencil shaving oakiness. A little time in the glass and warming up and we get a deeper richness of vanilla, absolutely bucket loads of berries, cranberry, strawberry, blackberry, all mushed up for pie filling. It’s immensely fruity, the oak notes have faded now. Luscious. Sweet fruity delivery, a little ginger and pepper spice and alcohol prickliness quickly fades, waves of fruit now. A lovely thick buttery texture. Vanilla cream. Bitter-ish oranges, cranberry, raspberry. All juicy and fresh. Quite tangy as well, lip smacking. Too easily sip-able in some ways, but then that’s what I want right now and it’s hitting the spot beautifully. The tangy fruits and vanilla butteriness goes into a medium to long length finish, drying out and becoming a little oaky with some lime peel zest. Enjoyed a fair bit of my dram neat, but will try a small drop in the remainder. The fruitiness on the nose is toned down slightly, with a re-entry of a little vanilla led oak Spice. The palate reflects this loss of fruitiness becoming more vanilla driven, much more of a bourbon oak matured whisky now, it’s almost like the port finishing didn’t happen. The finish is vanilla and oak. Nope. No to water. It’s brilliant without it. 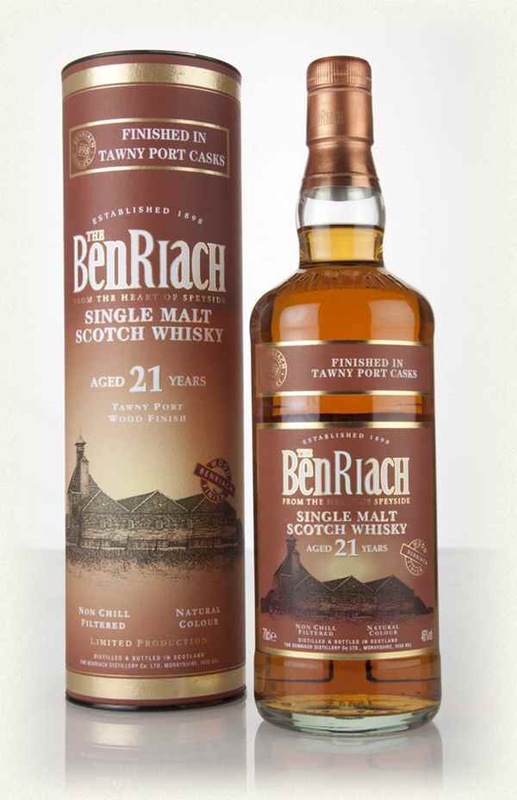 A lovely tasty Benriach, which has benefitted from its Tawny Port finishing period. 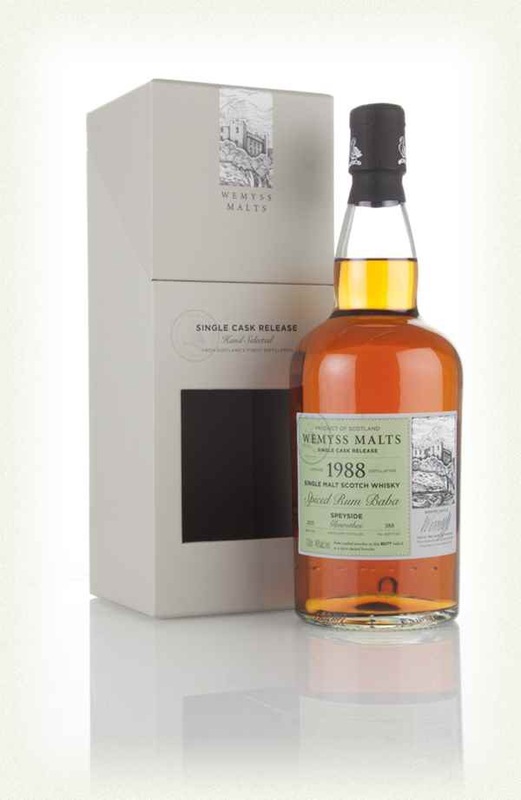 A lovely bursting fruit whisky which could be easily sipped over an seasonal evening’s event. It doesn’t handle water so well, so I would avoid any with this dram. It really doesn’t need it. Intensely stewed fruit, strawberry, cherry, apple, plum, all reduced down, soaked in rum and immensely satisfying. There’s a dusty nature to the nose, it clings to the inside of the nose. There are some pepper, clove and cinnamon spices, all light and complimentary. This nose is beautiful and difficult to break down. Very complex, warming to the senses, and compulsive to sniff. With time chocolate becomes present, Cocoa dust. Dry treacle sponge on the arrival becoming very thick very fast, with lots of intense dark fruits, cinnamon and clove, chocolate, fruitcake with a lot of cherries, orange juice, some light oaky notes, but it’s all about the cake fruit and intensity. Bloody delicious. The mouthfeel also enhances this overall experience as it sticks to the senses well. Milk chocolate, cherry juice, orange flesh and cinnamon stick around for a medium length finish. As it’s an older whisky, I’m only adding a very small few drops of water. The nose is deeper now, easier to get the nose right in there, more integration and more chocolate with the rich fruity goodness from the undiluted. The palate is awesome! It’s just everything of the undiluted with added depth and better integration. The finish is less on the cinnamon and more on the chocolate covered fruit cake. Goes from strength to strength with just a small drop of water added. This is a beautiful flavoursome whisky, sherry monster does best describe it. Loads of lovely fruits, and a perfect whisky for the autumn months or a special treat for friends and family on Xmas day. Delicious. First sniff is quite closed, but I have a sense that the smoke is building. Lots of clean fresh seaside air, ozone, fresh rain fall on lush grass, a touch of caramel. Smoke! But distant peat smoke. Letting this one sit with a cover for a little bit. Much more smoke after 15 minutes standing. Herbal notes as well, liquorice, throat sweets and burnt heather. Incredibly Islay as you would expect. Intense. A touch of sweet citrus in the background, almost clementine. Sweet sweet peat, grass, vanilla. Almost a herbal concentrated sweet liquor of an arrival. One of the oiliest mouthfeels you will ever have. Runny honey and some caramel. The development becomes more herbal, like chewing on liquorice root with a mouthful of peaty syrup. The ABV isn’t really felt like it should be. It goes hand in hand with the smoky inferno. It’s awesome. The finish is very herbal and drying, still a level of sweetness but the herbal fresh liquorice root is key here. Loads of smoke still! A few drops added. Smoke is a little bit extinguished. In honesty I think too much water went in. The palate is lovely and creamy, smokey and light, clean fresh and delicious all round. The finish is less herbal now, creamier and delicious. I need to do further experimentation with my own bottle. But I think a couple of drops helps this one along. I just gave it a little bit too much on this occasion. Awesome Islay represented in a blended malt of smokey significance. Love it. 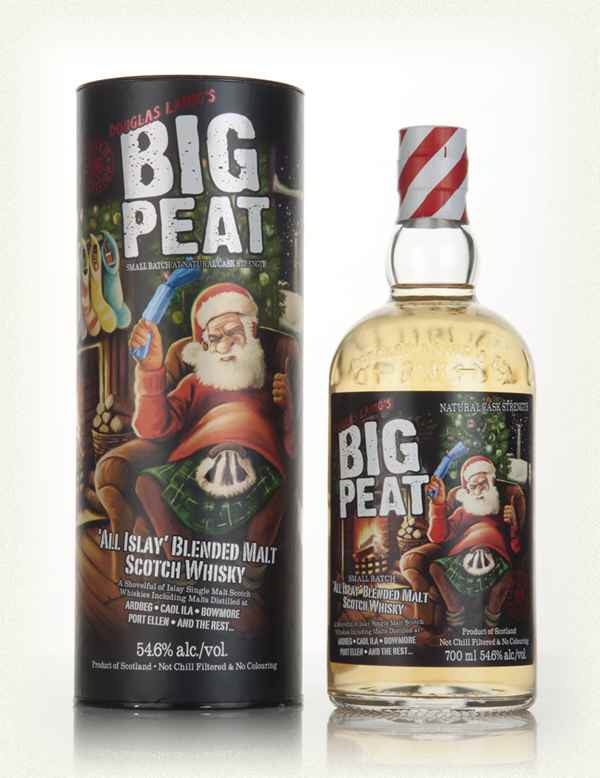 If you like smokey whisky this should be at the top of your Christmas list if you don’t already have a bottle or two. First sniff. Wow. That’s different. Initial thoughts are wine like. Grapes, dark with some intriguing spiciness. Sweet spices and a touch of herbal. More hints at traditional sherry notes but drier and spicier. Cherries. Cocktail cherries in syrup. Reminding me more and more of an old fashioned cocktail. Bourbon sweetness. Vanilla rich with clove. Brown sugar toasted top on a creme brûlée. Jammy red fruits. Jelly babies. Some dusting sugar. Underdone donuts from a market stall. Setting it down and going back gives more of those jelly sweets. More like the Christmas style of soft jelly sweets with sugar on. A hint of Turkish delight. A delicious confectionary nose, mouth watering and evolving. Mmmmmm. It’s taken 3 sips to write that. Very fruity. Vibrant. Lots of jammy sweet raspberry. Fruit Liquor. Loads of maraschino cherries. Some gentle cinnamon. Those jelly sweets from the nose are well and truly rich in the palate. It’s a massive fruit bomb. Orange marmalade makes an appearance, heavy on the juices. Beautifully thick mouthfeel makes the experience even more luxurious. A medium to long length finish. Loads of fruit continues through. Some sweet cinnamon spice, fruitcake comes back and a lip smacking cherry dryness. Small drop added. This is too nice neat. The nose is slightly weakened in its fruitiness with more vanilla evident. An extra Victoria sponge like aroma to it. The palate is lighter on the mouthfeel. Still intensely fruity, jammy and chewier. The finish is still fruity but a little shorter. Tough one as to wether this should be watered or not. I prefer undiluted although the palate is slightly easier with a drop of water. Bloody lovely. A massive fruit bomb. Incredibly tasty and totally delicious. 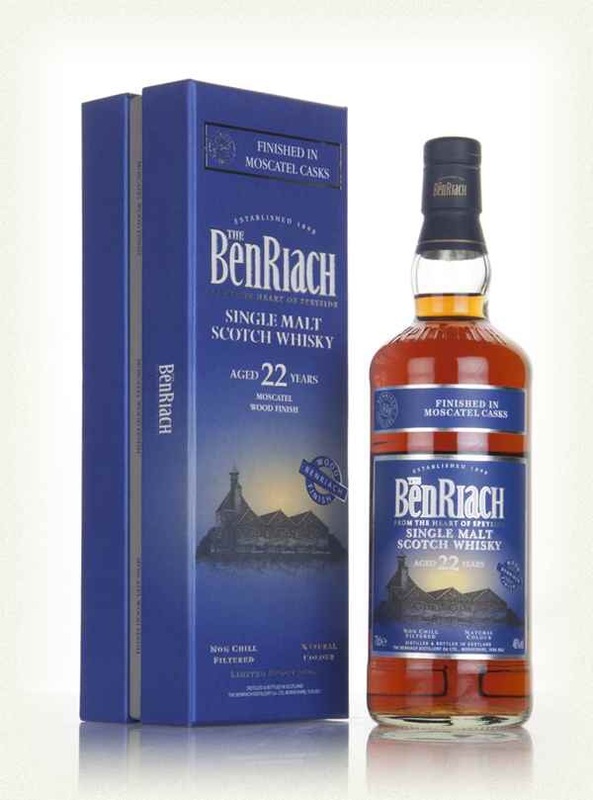 I absolutely love this style of whisky and it reminds me of the Single Cask Benriach (also a Moscatel finish) I had at Dramboree in 2015. Amazing stuff. I wish I had a bigger whisky budget because I would be getting one of these instantly. A return to age statements! Yay! I hope. Full bodied and rich nose, lots of fruitcake and rum soaked raisins. Characterful and very Macallan. Reminds me of the old 10/12 year old style. Lots of plums and a few stewed apples slipping in there as well. It’s fruity, but I do sense a little bit of youth in the background. Cinnamon icing, toasted hazelnut and toffee back things up. Hints of chocolate shavings also. It’s certainly a massive improvement over the gold and amber releases. A rich, slightly restrained arrival of fruitcake, orange zest, quickly becoming spicy and flavourful in the development. Lots of raisin, plum, fruitcake, orange juice, roast nuts, thick treacle toffee. A nice bite of Spice, ginger and cinnamon. Nicely balanced and really chewy with a massive yummy factor in the mouth. There’s a gentle oiliness on the mouthfeel and I would love to try this NCF at 46% or cask strength as it would be an absolute monster. A little on the short side, fruitcake, nuts and orange zest stick behind for a short while, but encourages the go back for another sip desire. I really don’t want to add water to this, so I drank the majority of my dram before adding the tiniest drop. The nose has become nuttier and lost some of the fruity richness of the undiluted. The palate hasn’t really changed for the greater or lesser, the finish seems a little fruitier and longer though. Hmmm, curious changes, worth further experimentation I would say. Unfortunately ran out of liquid to do it on this occasion though. The Macallan is a guilty pleasure of mine. The 10 year old Sherry cask was one of my first whisky discoveries (before the days of note taking) and it was one of my favourites. The old 12 year old is also awesome and I have a bottle or 2 stowed away for rainy winters. 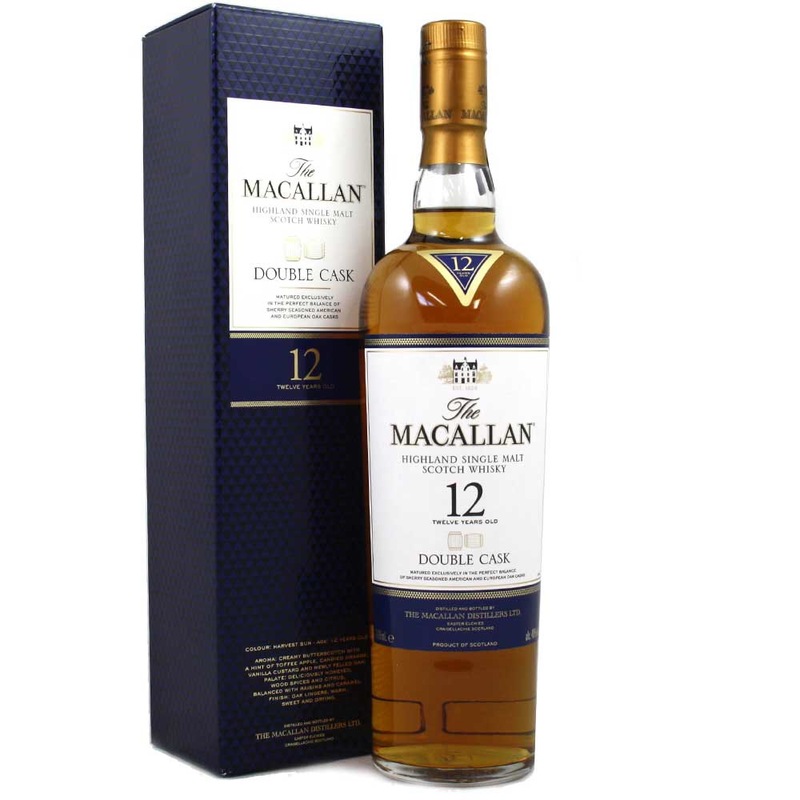 When the Macallan went to colour statements rather than aged ones it was a great disappointment to me. Gold and Amber are lacklustre to me (sorry) with the more impressive Sienna and gorgeous Ruby being a challenge on the purse strings. This new 12 year old release I’m happy to say is great though. It’s getting back to the belt and braces Macallan style and I love it, it’s easy going session whisky of some quality. This is Christmas Day whisky, unashamed, opened as soon as the turkey is ready to hit the oven and savoured over the day. (Drink responsibly folks!). Already on my Christmas list. Many thanks to the Macallan for the review sample.